Let’s talk about stairs today, shall we? We can talk about the idea of stairs, what they do, where they lead, and what an imaginative mind can do with them. I have stairs in my house. I didn’t particularly want stairs in my house. But, I have them, just the same. When I was looking for my last house, I looked at homes with and without stairs. I decided the homes without stairs were far more appealing to me. So, when I looked for my current home, I put “ranch style” as a primary criteria. Oh, I did look at a couple of split levels, but knew as soon as I toured them that I wouldn’t want one. Much to my surprise, the home I fell in love with was a two-story Cape Cod – of course, where there is more than one story, there must be stairs. 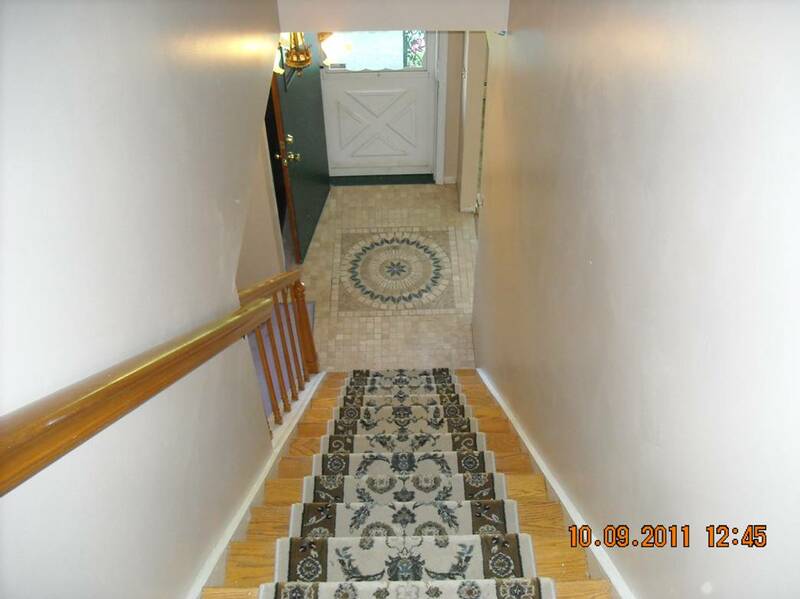 The photos on the realty sites screamed out at me and when I went to see it, I fell head over heels in love with it! The stairs still concerned me, but I decided to just try to get over it. And I have…..gotten over it, that is. So, before we get into some of the more fun stuff…….why is it that I was so determined to not have stairs in my house? Well, first and foremost, I have a bad knee and stairs tend to aggravate it. So far, that hasn’t been a problem at all. They have a comfortable rise and it doesn’t tend to bother my knee – even when it is irritated already, I just need to take it slower when that is the case. Oh, believe me, I’m not running up and down them by any means, but they aren’t a problem for me. Secondly, I have a sometimes overwhelming fear of falling. 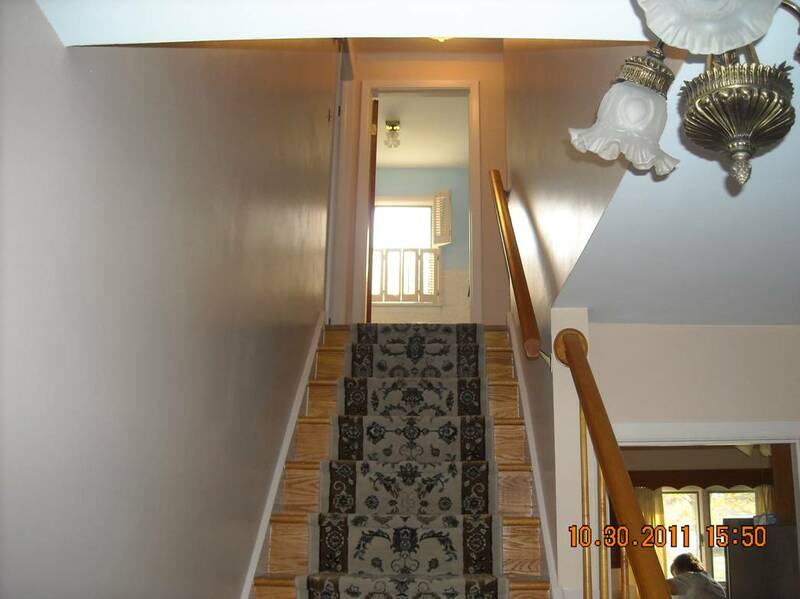 To help me with that concern, I took out the bulky carpet that was on the stairs when I bought the house and replaced it with a nice, low profile, tight runner – more functional, safe, and looks so much better, too! I also ensure I have a hand free to hold the railing and let the dogs go down ahead of me so they don’t accidentally trip me up. Problem numbers one and two – gone! The third concern was just fear of an upstairs…….I know, what is wrong with this girl? Well, I only lived in two houses with upstairs living areas before this one (actually, the first few homes I lived in as a baby and small child had upstairs living areas, but I was too young to remember any of them, so they aren’t involved in this story). Both of the homes I’m talking about had upstairs that gave me the creeps. I have no idea why, but I really hated being up there alone and felt creepy even if others were with me. Yeah, one was when I was a child, so you could chalk that up to childish fears and imaginations – there was an attic door that led to a dark, scary attic and railroad tracks that were close by and caused dreams of hobos hopping off the trains and climbing into my bedroom windows (yeah, the weird dreams I have started early in life). But, the other was when I was a married adult, so that is totally unexplainable, except that it was a somewhat unfinished area that we used primarily for storage until my older step-son came to live with us for a while and wanted his room up there, so I really didn’t have a lot of need to go up there. But, I am not only fully comfortable in the upstairs here, I actually enjoy it! I have a huge dormer in my bedroom (both front bedrooms have them) that I have a lovely sitting area in and really enjoy sitting there looking out the window or reading. 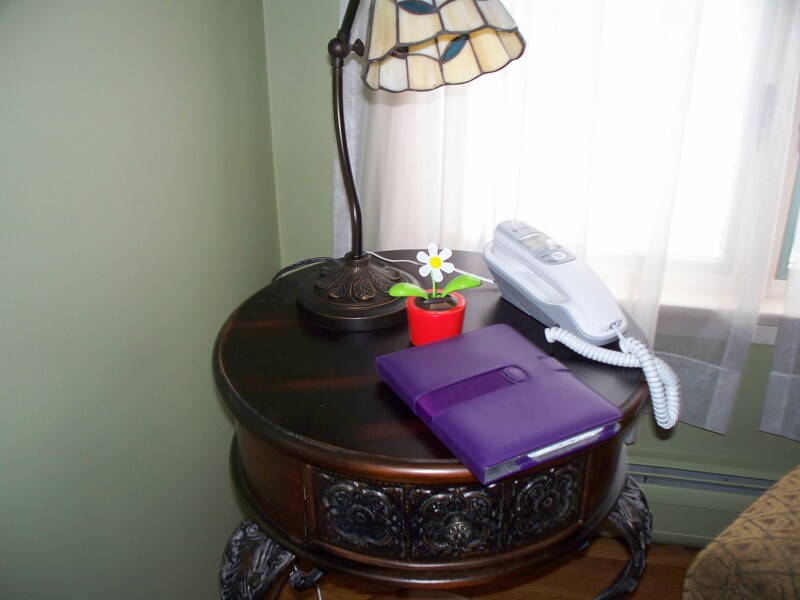 It is one of my most favorite spots in the house to sit and relax. I even joke to myself about something that would normally give me the creeps, but doesn’t — when I sit in the dormer looking out the window over the neighborhood, I think of the creepy mother in “Psycho” – hahaha!!! The other image that comes to mind is the old woman in the book “Mill River Recluse”, who enjoyed looking out the bedroom window in her marble mansion on the hill onto the community below – a much more pleasant analogy, for sure. So, problem number three didn’t need to be overcome – it was non-existent! When I say this house is the PERFECT house for me, I mean that from top to bottom! So, stairs? No problem! So, we know what my idea of stairs is – or was, until I found these very pleasant stairs. 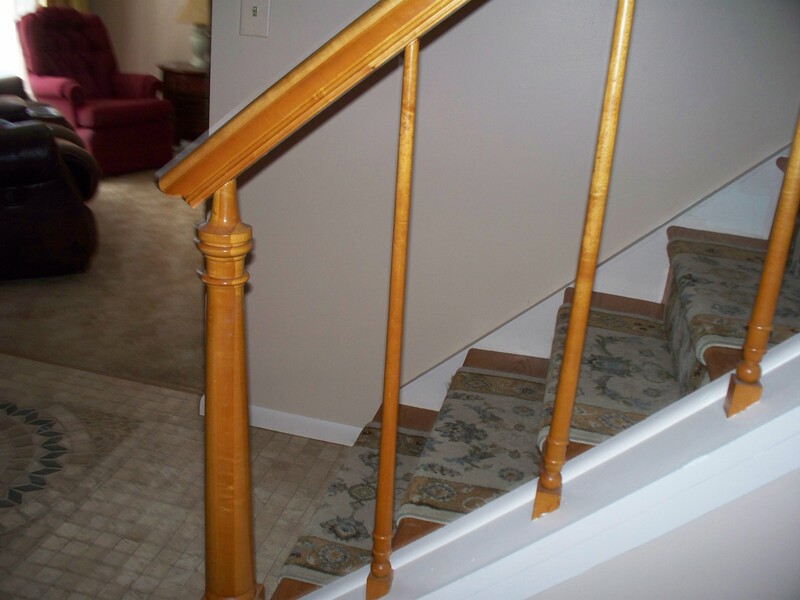 We know what stairs do – they provide a method of movement from one story to another. 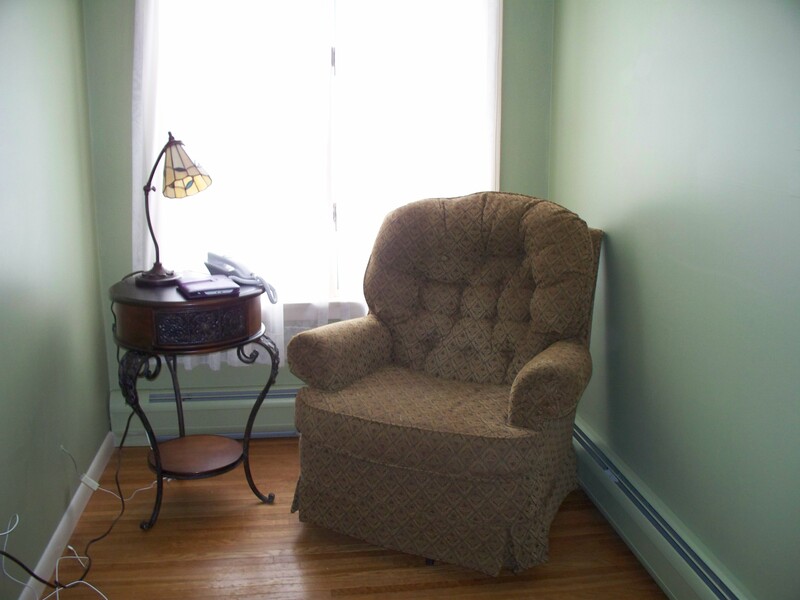 We know where they lead to in my house – the upstairs living area that consists of my master bedroom with a fabulous sitting area, a guest room, a laundry room, and the full bathroom. Now, let’s talk about what fun imaginative minds can have with stairs. My brother used to love to slide down the bannister when we lived at my grandparent’s house (the one with the scary upstairs). It was a clear shot from the top to the bottom and there was a circular post at the end to stop him from falling off onto the floor. Lord help him if my Grandfather were to catch him, but he would do it whenever he thought there was a chance of getting away with it! hahaha A bannister is a wonderful thing for the imaginative mind of a child. They can be a super hero rushing off to save a damsel in distress or a fireman sliding down the pole to be whisked off to a fire or a daring circus artist performing a death-defying act – the scenarios are endless! Not that I would try it, but I know the bannister here isn’t all that conducive to sliding down it! The bannister only goes half way up the stairs (and then there is a wall and just a railing the rest of the way to the top) and it ends abruptly (nothing to stop you from falling onto the floor), plus, the spindles are rather small, so might not withstand too much weight on them. So, no bannister sliding fun in this house! For my four-legged babies – the girls, the stairs are a playground! Katie and Amy wrestle on their way up and down the stairs – at first I worried they would get tangled up and tumble down the stairs and get hurt, but they keep their balance and continue their playful fun. Megan was apprehensive about the stairs, at first. The night we arrived in our new home, she was the first to go upstairs to check out the rest of the house – she’s my nosy one! 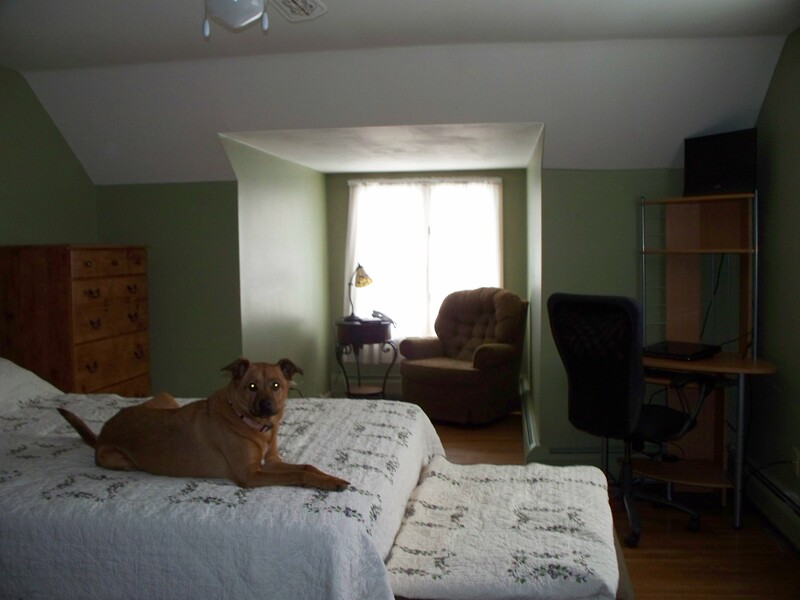 But, after she ran all over every room up there, I heard her whimpering. I looked up the stairs and she was standing at the top with most of her body around the corner in the bedroom looking down from a safe distance. Her head was hanging down and she was whining! I called to her, but she wouldn’t come down. I went up to see if she’d come down with me, but no dice – she was clearly petrified to go down the stairs. In the mean time, Katie and Amy had gone up and down at least a dozen times. I tried to get her to go with me while I scooched down the stairs beside her – as long as my hand was on her back and I was right beside her, she was fine. We got to the bottom and she ran off to explore more of her new home. She followed the other girls back up and was, again, scared to death to come back down. So, I sat at the top and had her sit beside me and watch the other two go up and down. Finally, she followed them down and has been fine ever since – she just had to be taught how to go down! So, I’ll leave you on that note! Next time you go up a set of stairs, think about what they mean to you, where they go, what wonderful things they allow you to do, what creative fun you might have with them, and……….dance!!! !